MIAMI, Florida -- As of 11:00 a.m. Eastern Daylight Time on Thursday, October 25, 2012, NOAA's National Hurricane Center in Miami, Florida, has issued its tropical weather outlook due to the presence of Hurricane Sandy in the Caribbean Sea and Tropical Storm Tony in the central tropical Atlantic. Hurricane Sandy is located about 300 miles southeast of Miami, Florida with maximum sustained winds of 105 miles per hour - making Sandy a Category 2 Hurricane. Hurricane Sandy is moving to the north at 16 miles per hour. NOAA's storm tracker forecasts that Hurricane Sandy will remain at hurricane strength as it approaches the Bahamas today. Hurricane Sandy is forecast to weaken to a Category 1 hurricane after it crosses the Bahamas into the open Atlantic less than 200 miles off the South Florida coast on Friday, and less than 200 miles off the Central Florida coast on Saturday, and less than 200 miles off the North Carolina coast on Sunday. Later in the week, Hurricane Sandy is forecast to weaken to a tropical storm and make landfall on or around New Jersey on Tuesday. New York City, Boston, and Washington D.C. are all within the current landfall forecast cone of uncertainty. NOAA warns that a storm surge of 5 to 8 feet is possible for the Hurricane Warning area in the Bahamas, and 1 to 2 feet within the Warning Area for the Florida coast. Warning areas are displayed in the above image. Meanwhile, Tropical Storm Tony is located in the central Atlantic and not expected to impact any land within the next 48 hours. Elsewhere in the Atlantic, tropical storm formation is not expected during the next 48 hours. MONITOR THE PROGRESS OF SANDY. 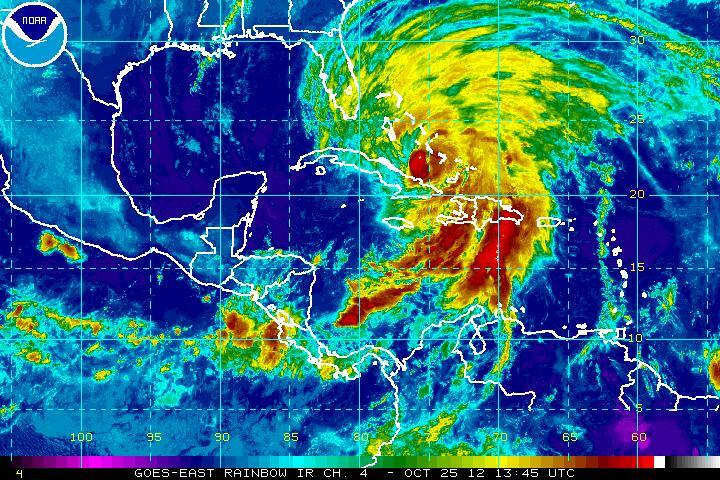 WATER LEVELS WILL BEGIN TO SUBSIDE IN CUBA AND JAMAICA LATER TODAY.